The luxury watch winders of CHRONOVISION are hand crafted in Germany to fulfil the highest demands of passionate watch lovers. Innovative functions developed and patented by CHRONOVISION guarantee best winding results for exclusive timepieces. CHRONOVISION design safes secure watches and other jewelry in the most elegant way. Size, security grade and design can be customized. 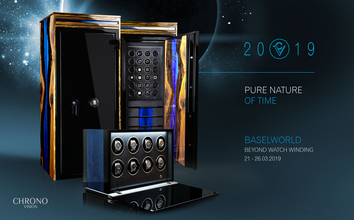 2019 we are hosting Designhütte Store - Europe’s largest distributor for Watch Winders, Watch Boxes and Jewellery Cases. The new version of the Chronovision Connect app takes the intuitive operation of Chronovision watch winders to a new level. Chronovision – Exclusive watch winders Made in Germany. The world-wide unique communication system enables extraordinary functions. Interfaces as USB and Bluetooth guarantee maximum comfort. The Ambiance series of watch winders combine the latest CHRONOVISION watch winder technology in exclusive cabinets havining special light features to create a unique atmosphere. This extraordinary design watch winders does not need many words. No matter if positioned on its stand or being mounted on a wall, this is the perfect instrument for storaging mechanical timepieces. The Collectors Choice. This unique instrument of time is made to store and wind up to 64 watches. The timepieces are protected behind privacy glass which can be opened by a biometric finger-scan. Drawers below offer additional space for valuable goods. Luxury Protection of valuable timepieces is a special strength of CHRONOVISION. All safes manufactured can be customized in size, security grade and appearance to meet the watch collectors needs.